Whispers in the Loggia: As US Celebrates Su Madre, "Guadalupe Is Speaking To the 'Dreamers'"
As US Celebrates Su Madre, "Guadalupe Is Speaking To the 'Dreamers'"
Saludos y alegria a todos en esta Noche Grandísima de la Iglesia en estos Estados – to one and all, greetings from Stateside Catholicism's Biggest Night: the first leg of today's feast of Our Lady of Guadalupe, Mother of the one American land, above all those in need within it. 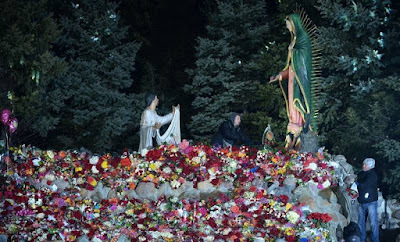 With churches great and small packed from coast to coast – and staying that way all through this 486th anniversary of the Morenita's appearance at Tepeyac – a full roundup will come later. 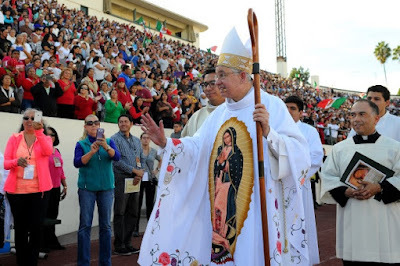 For now, as the US bishops have continued the practice begun in the wake of last year's election in designating this feast as the national church's Day of Solidarity with Immigrants, the principal message for the occasion has come late (or early) from the largest US diocese, as the bench's Chief-in-Waiting – the current USCCB vice-president, Archbishop José Gomez of Los Angeles – delivered a pointed homily to a standing-room crowd in the 4,700-seat Cathedral of Our Lady of the Angels at the traditional Midnight Mass. What a beautiful night! And what a joy it is to worship God tonight and to thank him for the gift of Tepeyac. In our prayers tonight, let us keep close to our heart — all those who are suffering because of the fires. Let us entrust them all to the Virgin’s maternal tenderness and may she help them by her prayers and example — to go forward with courage and faith and hope in God. This past summer, I had the blessing to lead a pilgrimage from the Archdiocese of Los Angeles to the Basilica of Our Lady of Guadalpe. Like many of you, I had made that pilgrimage many times with my family, since I was a young child. But as a priest, it is something special to be there. It causes strong emotions for me to now be a priest and to have the privilege to celebrate the Holy Mass at the main altar in the Basilica. As you know, the altar sits directly underneath the miraculous image of the Virgin. And I have to share with you, when you are there, you can truly feel the warmth of her tender eyes. You really know that you are loved in a special way by the Mother of God. And this is true for all of us. This is what we are celebrating tonight. My brothers and sisters, Our Mother is speaking these words to the Church today. And to each one of us. Tonight Our Lady is speaking these words to all of you who are worried about your immigration status and the changes in our country. She is speaking these tender words of assurance especially to the “Dreamers.” Tonight we ask her in a special way to speak to the hearts of our leaders in Washington, to open their hearts to the pain, the human suffering going on in our families and in our communities and find a permanent legislative solution to bring peace and stability to our young brothers and sisters and their families. My brothers and sisters, tonight we lay our fears and hopes at the feet of the Virgin. We ask for the grace to contemplate these times we are living in under the gaze of her loving eyes. We know that she is our protector, our advocate. In that great vision from the Book of Revelation that we heard tonight in the second reading — we see Mary defending her child, defending the Church against the devil. This is her role. She wraps us in her mantle, in the beautiful tilma. And she guides us, all the days of our lives, like a mother, to the throne of God. Our Lady comes to help us — to intercede for us. Just as she went to her cousin, Elizabeth, in her hour of need, as we heard in our Gospel reading tonight. Our Lady is still making her “visitation” to us. She hears our cries, our cares — and she comes to us. Always! This is what families do! We stand together, we help one another! My brothers and sisters, we need to be more like Our Blessed Mother. What is it about Mary? What is the most important thing? In her life, she said “yes” to God with her whole heart. She did not hold anything back. What God wanted, she would try to do. Now, that means two things — first, it means she had to listen to God. You cannot know what God wants you to do, unless you are trying to listen. So we have to try to listen. Read the Gospels every day. It is great reading and that is Jesus is speaking to you — as a child of God, as a child of Mary. Or to spend some time in prayer, listening and asking God for his will in your personal life. The second mystery is the Visitation — where Mary goes off and serves her cousin Elizabeth, who is elderly, and is with child, with the Child St. John the Baptist. That is why we heard the story again in our Gospel passage tonight. God wants us to be deeply involved in the lives of others — especially in the lives of those in our families. We need to stick together. We need to make our families and our communities strong — by being strong people ourselves. By living with virtue — just living the “Golden Rule.” This is the foundation for a good life — trying to be like Jesus. And what Jesus said is that we need to treat others as we want to be treated. Very simple. But we need to keep being reminded. "It Happened To Our Fathers...."